This course walks through the basics of creating jewelry using a forge and anvil. Participants will create their own copper bracelet while learning forge safety as well as artistic techniques. Students will learn to hammer round copper flat on the anvil, and stamp it with designs. 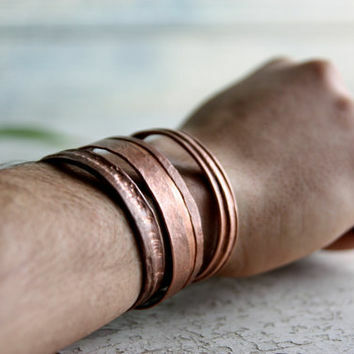 Learn to RIP, anneal, and temper the copper so that it can be shaped into a bracelet. Participants will then practice sanding and polishing their work. Workshop attendees will need to be properly outfitted to attend this course: closed toed leather boots, a long sleeve shirt, long pants, and a way to secure long hair are mandatory. Safety equipment including protective glasses, gloves, and hearing protection are provided by MAKE Santa Fe. Patricia Strout is an active participant, teacher, and volunteer at MAKE Santa Fe. She teaches several classes ranging from metal fabrication to jewelry making, and is a devoted advocate of our mission, as a volunteer metal shop coordinator.